But I digress. There’s a good read this morning in the Hollywood Reporter, in which we can learn how a few filmmakers this season have been dealing with tight budgets (haven’t we all?). Lee Daniels had to abandon plans for an animated sequence in “Precious” for lack of funds, creating the film’s compelling fantasy sequences instead. Jim Sheridan, for “Brothers” (opening here Dec. 4) had to shoot war scenes in New Mexico instead of Afghanistan, and had to coax Tobey Maguire to forego Christmas feasting in order to lose weight in a hurry — there wasn’t time to suspend production while he dropped 20 pounds. 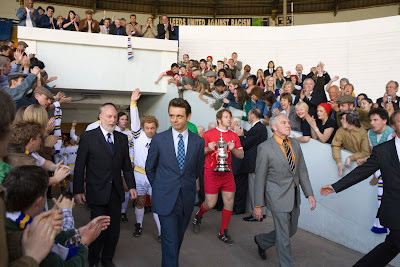 Tom Hooper paid extras with fish and chips and used inflatable dummies to beef up the crowd in the football-stadium scenes in “<a href=" “>The Damned United.” And Tom Ford, who in his spare time is a well-known fashion designer, used furniture from his own house to create his main character’s posh 1962 home in “A Single Man” (opening Dec. 25). And he rewrote one scene to take place in a near-empty parking lot rather than on a highway, thus eliminating the need for street closures and multiple vintage cars. But not everyone adapts easily to budget constraints. Mira Nair, according to this story, threatened a hunger strike when she was told she couldn’t fly a replica of Amelia Earhart’s plane from Canada to Africa in “Amelia.” (She won the argument, but was given strict time constraints.) Maybe she should have held out for a better screenplay instead.